Reminder: The department will no longer mail new licenses. Instead, the department has implemented a new process that will allow licensees to print their licenses by logging into their secure on-line account. This will cut 7-10 business days off the process. This same process will allow licensees to renew on-line as well. Laws & Rules portion for endorsement Candidates; there were 3 options presented. The committee voted for option 2 which will require an endorsement candidates to take and pass the current Business & Finance Exam which contains 20 questions on Florida Laws & Rules. Knowledge of Florida Building Code for endorsement Candidates: there were 2 options presented. The committee voted for option 1which will require an endorsement candidates to take and pass the current DBPR /BCAIB Principles & Practices Exam for Building Code Administrators & Inspectors. The committees made motions and passed both of the above options and will move it to the Board to open the rule for further development. There was one applicant seeking to qualify his third company and one seeking to qualify his fourth company. Both were approved. There was one applicant denied because he was being paid by a 1099. There were two cases involving failure to pull a permit on an A/C change out. Both claimed the owner was pulling the permit; however, no permit was pulled. One applicant was denied due to an open DBPR enforcement objection by the prosecuting attorney. There was one case where the applicant was not present for the meting however his attorney was on hand to represent his client. The board at first questioned whether a personal appearance was required by the applicant, but after a short discussion the bard deemed the attorney’s presence was satisfactory to meet the requirement. The applicant was approved. All other cases were very ordinary. Once case where an applicant, who installs water cooling towers, passed the GC exams, applied for a GC license but for lack of 4-story experience was instead granted an Industrial Facilities Specialty License. Upon closer reading of the scope of work under Industrial Faculties Specialty category this license seemed a bad fit and in actuality the Tower Specialty License would have been more appropriate. 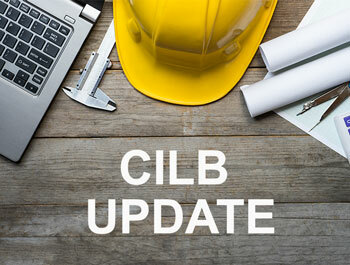 CILB Council gave a rules update. 61G4-12.007 – This rule stipulates when the cutoff deadline for submitting materials to the board is. The proposed language states 21 days. This is an effort to reduce last minute amendments to candidate’s board packages by putting the cutoff date in writing. The proposed language amendment is in the regulatory process. Jim Evetts made a motion to amend the language to “20% or more” rather greater than 20%. There was a 2nd and the motion passed. Rachel will change the language. 61G4-15.0021, Business Organizations. a proposed to change the terms of when a license who wishes to qualify a 2nd or 3rd entity would have to appear before the board. The proposal would strike the 50% rule for ownership (present and proposed business organizations), add that applicants with 20% or greater ownership of the proposed business organization will not have to appear before the board if the applicant otherwise qualifies for approval. In addition, the board would delegate authority to the Executive Director and/or Board Chair to waive mandatory appearance requirements where applicants are in compliance with Rule 61G4-15.0024, F.A.C. Lastly, the proposed change would require any applicant seeking to qualify three (3) or more business organizations, regardless of percent of ownership, to appear before the board. The proposed language amendment is in the regulatory process. 61G4-15.032 Cleaning up the language in this rule which still required an affidavit of experience. Should be adopted a you read this newsletter. 61G4-18.001, Continuing Education – The revised rule updates the language to include the most recent exceptions from the 2017 Florida Building Code into the rule by reference. The amended rule took effect May 28, 2018. 61G4-15.004 Licensure by Endorsement As per the recommendation of the Endorsement committee this rule was opene3d to add the language as proposed by the committee and get the regulatory process going. This was former Board Chair Christopher Cobb’s last meeting and there were the customary heartfelt appreciation speeches, goodbye’s and a plaque! There was one declaratory statement.